Our first article is by Andy Pope, PADI Course Director and the General Manager at Atlantis Dive Resort, Puerto Galera, Philippines. He can be contacted on info@atlantishotel.com. Other views on Puerto Galera are at the bottom of the page. For diving centres see the Philippines Dive Operators page. 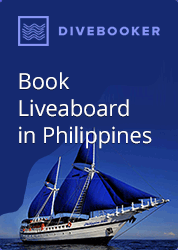 Philippines Liveaboards - Compare prices online. Book now & pay later. For expats living in Asia, The Philippines offers some great leisure and holiday experiences, not least of which are the fantastic reefs of Puerto Galera. Despite a lot of bad publicity relating to kidnappings and the political situation most tourist destinations remain as far away from any trouble as you could ever want to be. The Spaniards discovered Puerto Galera in the early 16th century as a safe haven for their trade ships during heavy squalls and typhoons; the words literally mean "Port of the Galleons". The sheltered Bay of Puerto Galera itself remains an anchorage for boats during bad weather to this day, although it's the beaches of Small Lalaguna and Sabang that now provide the main attraction to newcomers. Local outrigger "bangka" boats are the most common form of transport to the sloping reefs where the marine life improves yearly. Regulars to the area usually make a habit of visiting The Canyons or Hole in the Wall which have always been great dives but with added protection over recent years are now undoubtedly world class. "The Canyons", which usually finishes on a large coral encrusted Galleon anchor, is home to large schools of Yellow Tail Snappers, Sweetlips, Rabbit Fish, Bat Fish and Emperors as well as the usual abundance of smaller reef fish. With sightings of Manta Rays, Hammerhead and Thresher Sharks in the area, why go anywhere else? Puerto Galera is a great "all year round" dive destination, the water temperature varies from between 22 oC in February, to 29 oC in May and June and it's unusual for the visibility to drop below 15 m. Big tidal exchanges make for some exciting drift dives. Kilima Drift is a favorite for those who prefer roller-coaster dives, but if you prefer a leisurely hour at 12 m, Coral Gardens and West Escarceo have unbeatable Table Corals, Fans, Basket Sponges and smaller aquatic life. If you want to venture further afield there are some great day trips to either Verde Island and the famous Drop Off or the volcanic Hot Springs at Chicken Feather Island where you can sit at a depth of 20 m watching hot bubbles rise from the ocean floor. Puerto is also a convenient starting place for five-day liveaboard trips to Apo Reef and the Wrecks of Coron. Something for everyone. A feature of recent developments has been Dive Centre collaboration. Several wooden boats have been sunk which have all made interesting sites and three years ago dive operators in the area got together to create "The Puerto Galera Dive Association". Since its conception the association has worked to improve safety, dive shop communication, community involvement and general diving around Puerto Galera. The association meets monthly and is currently working on, amongst other things, conservation in the area and mooring improvements. Last year the Association leased with The University of the Philippines and assisted in a successful Giant Clam seeding project. Puerto Galera also offers numerous isolated coves and beaches just waiting for your visit, there are not many places left in the world where you can have a whole beach to yourself. Kayaking, hiking, swimming and snorkeling add to the list of non-diving activities. Some of the best views are from Ponderosa, a nine-hole golf course 1400 feet up a near-by mountain. Of the regular attractions, the biggest Hash Run (no drugs involved!) in the Philippines meets every Sunday afternoon outside Captain Greggs. The runs wind their way through the beautiful Puerto scenery to the ever-popular "On On" (post run/walk party), although most people just enjoy a leisurely stroll to the awaiting beer. The area is a popular, safe location for single travellers as well as a growing family destination. Direct private transfers from Manila, hot water, mini bars, internet facilities, swimming pools and great variety of restaurants, including Thai, Indian and Italian as well as local cuisine all combine to make the area one of the most popular weekend retreats for Manila residents. The area is malaria free with only the usual vaccination requirements. If you're looking for a mix of local "laid back" charm, fun and great diving, look no further. Enjoy bountiful marine life on every dive, maybe not Manta's and Hammerheads, but have you ever seen a Pigmy Seahorse or a Robust Ghost Pipefish? And, if you reading this thinking about furthering your dive training - undoubtedly some of the best Dive Instruction in Asia. Legend has it that once sailors arrived on the island; they never wanted to leave without a promise to come back. Puerto Galera and Verde is a 45 min. banca or ferry ride away from the Port of Batangas City. It is accessible by either private transportation or the numerous buses that leave Manila every half hour or so. If the Philippines is the "center of the center of marine bio-diversity" the Verde Island passage is the "Center of the center of the center of marine bio-diversity" or the marine equivalent of the Amazon River Basin. This 10 km by 10 km area between the provinces of Batangas and Mindoro has 1,736 species , the highest concentration of marine life on the planet! Canyons, their most famous divesite, is world class. A series of 3 canyons, whose sides are completely covered by pink dendronepthya and whip corals, shelter residents that include spotted, oblique, striped and oriental sweetlips. Giant trevallys and batfishes hide among spectacular seafans and barrel sponges while large schools of snappers part their flanks to let a group of beautiful blue-finned travallies and emperor fish pass through. Hole in the Wall is exactly that, a hole on a coral covered underwater ridge at 14 mtrs. which divers can swim through. Once past the hole, several coral heads provide shelter from currents that are often present. Huge trevallies, Emperor fish, batfish usually gather in shoals overhead and ride the moving water like a ferris wheel. St. Cristopher is one of several wrecks in the area and is home to a photogenic school of batfishes, yellow snappers, maroon frogfish, rabbitfishes and Angelfishes. The same can be said about the Sabang wrecks close by. There is also a seafan in about 15 mtrs of water that are very popular with photographers because of it's resident pygmy seahorses. San Agapito Wall off Verde Island across the passage is another world class site. Marked by a small group of rocks that break the surface, it is a true wall that extends downwards in excess of 70 mtrs. Schools of trevallies, batfishes, triggerfishes can be seen at the Southeastern most point while hordes of Fusiliers and wide-mouth mackerel , bannerfishes and butterfly fish occupy the west wall. There are also resident banded seasnakes and yellow frogfishes. Humongous seafans and eyecatching tree corals in a wide variety of colors are present throughout. "While it's generally not on anyone's list of the best places to go, I found Puerto Galera to easily be as good as Yap, the Red Sea, and other similar places (I might even add Palau) when it comes to coral health and the variety of small and unusual animal life. When added to how inexpensive accommodation, food, and diving are, it is a very good deal. My recommendation for accommodation/diving would be the El Galleon Hotel, and the Asia Divers shop right at the hotel." "In september 2007 I spent 2 weeks diving; first one week in Puerta Galera Atlantis resort and the second wonderful week at Dumaguete Atlantis resort, both were fabulous with 4 dives a day if you choose ( no extra charge!) and 5 star accommodation s at both resorts. Every dive lasted almost an hour and marine life is abundant, divemasters very professional and competent. Just GO !!" "Puerto Galera diving resort is one of the best in the world." "The diving at Puerto Galera is varied and increasingly good, due to conservation in my experience. It is a great location for those looking to do more advanced diving courses, eg divemaster, as the proximity of many dive sites (circa 10 minutes) enables you to undertake more diving quickly than you could in many other resorts"
"Fantastic diving, super low cost, wonderful nightlife." "In my opinion Puerto Galera offers some of the best diving the world has to offer, I have had the experience of diving with some of the most amazing speices of fish there. Sea snakes, Frog fish, Trigger fish, Giant Turtles (green Back Hook Billed) Sweet lips, Giant Groupers, Tuna, Baracudda and with white tip reef sharks and even with a 5meter thresher shark." "Verde island, Puerto Galera Philippines is defenetely one of my best dive site ever!!! The most per square meters I've ever seen!" "Verde Island Puerto Galera is a haven of nudibranchs, frog fish and scorpion fish. During colder months in December nudibranchs mating can be seen. Recently some divers found approximately 450 mm long nudibranchs at 28m depth with eggs close by. Electric Clams, Sea Horses and Blue Ring Octopus can be found at close by." "Dry Dock has many creatures...a great Macro dive and is deal for dining profite of Nitrox. The Canyons are fantastic for larger fishes in currents with limited access due to tide tables for safety. Verde Island is another great place for current diving but also nice in slack tides as well. A large variety of marine diversity and usually great visibility." Travel guide, Filipino phrasebook and Southeast islands bundle. 2015. If you have more information about diving the Philippines we'd love to hear from you. Send us your comments below or fill in our more detailed recommendations form.